Coffee is Vitamin Flintheart’s financial adviser and as such is forced to deal with the eccentric thespian’s many whims. A great example of this came during the first case involving Siver and Sprocket Nitrate. Silver worked to scam Vitamin out of $300,000 for fake Captain Video film featuring Vitamin’s first role on film. Vitamin requested the small denomination bills from Coffee, who was very surprised and argued against the request. Readers would later learn Vitamin knew the footage wasn’t him and was simply trying to reveal the Nitrate scam. Per Mike Curtis, the character Coffee is based on Jeff Sinsley. 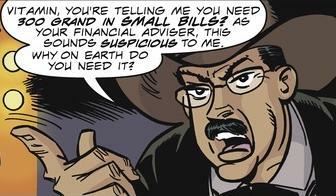 The character Coffee has shown up in Gasoline Alley and Lum and Abner besides his regular role as Flintheart’s adviser.